As I mentioned yesterday a vintage Omega fell into my lap that I didn't expect. The story behind it is that there is a super nice fellow watch collector who owns a business near me where he buys precious metals and watches. My wife met him the week before, they talked, and he said he had heard about me and my minor claim to fame in the watch world. He told her that he'd like to meet me in person and talk watches so with her being my consigliere she set up a meeting for this past Saturday. I bought part of my watch collection and he brought part of his to his office for the meeting. He just happened to have a vintage Omega that my wife and I were drawn to as soon as we saw it and he left me with an open offer to make a deal on it. At the end of the meeting he said he could come by my home to talk more about watches, guns, cars, and look at any jewellery we had that we no longer wore. I happened to have a gold charm bracelet that was my mothers that to the best of my knowledge she was wearing when she took her own life and tired to take mine when she shot me three times twelve years ago. I found the bracelet amongst my belongings recently, and while I harbor no ill feelings to my mother, seeing it brought about a sickening feeling to my stomach along with a headache a burning feeling to the right side of my forehead that was akin to what it felt like when I took a round there. I decided to pull it out to see what his offer for it was and to my surprise he offered me the watch plus cash my way for it. I can now proudly say I turned a bad memory into a new Omega plus cash. The watch is special in the history of Omega as it is the first integrated bracelet Constellation and it's fairly rare to see this 168.045 in two-tone as you usually you find them in stainless steel with a white gold fluted bezel. 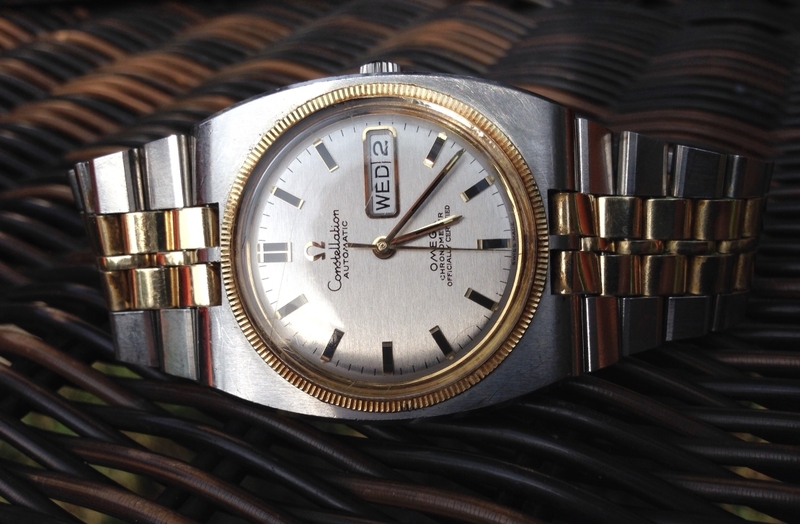 Omega did offer an all gold model back when they first released this model in 1969, but for some reason you don't see this 14kt gold filled bracelet with 14kt gold bezel, markers, and hands too often on the used market. This watch seems to have been waiting for me as it was sized perfectly for my wrist when I found it and it appears to be keeping time at a fantastic rate. I haven't timed it yet as the gentleman I got it from had just gotten it in so the service history is unknown, but the movement is as clean as can be and the watch still has the factory finish on it. I had to polish the crystal, some nicks in the case and wrist cheese from the clasp and bracelet, but the watch is otherwise fantastic given that it was made in 1970/71. 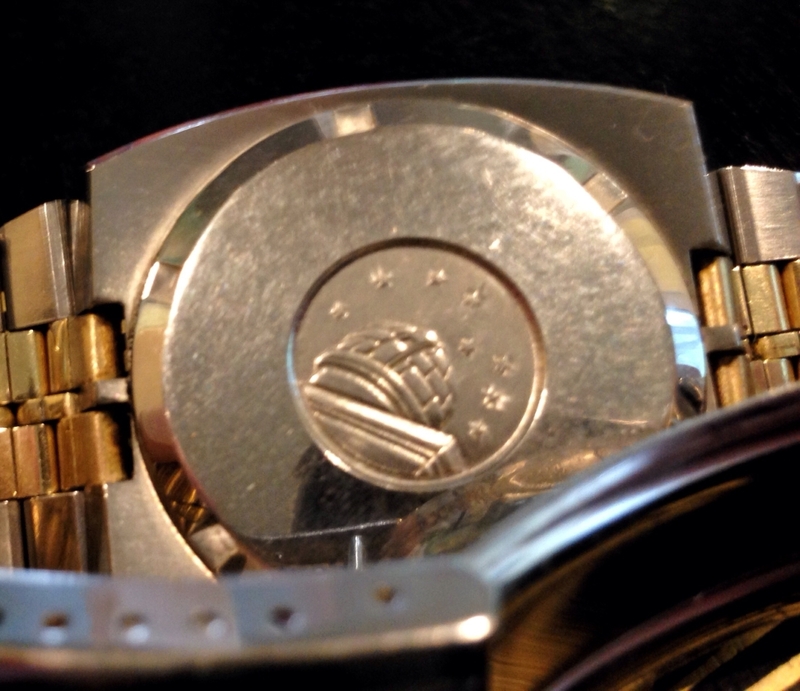 The case back is interesting as it is original and it disproves the belief that only all gold models have the bricks on the dome of the observatory. At this point it could be, in theory, that the bricks are there for this model due to the gold bezel on either the steel model with white gold bezel or the yellow gold bezel on the two-tone model. As with all vintage Omegas any general rules of thumb may not always apply as Omega constantly changed the rules when the quartz crisis was lingering or occurring. The watch is simply fantastic in person when you stop to think that at this point in history Omega was still thought to be above Rolex. Back when the Constellation line was for the most part the top tier of the Omega line as all models had chronometer grade movements. 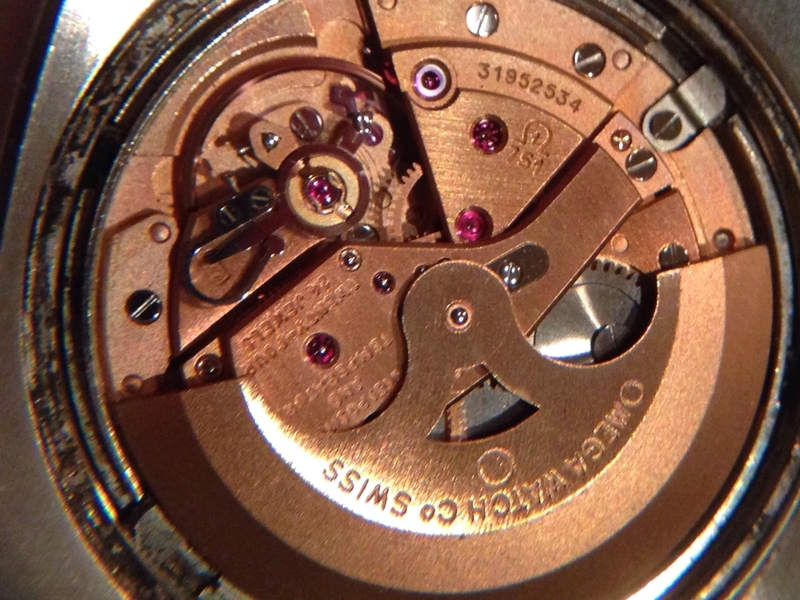 The 751 movement is based on the famed 500 series calibers with its heritage being the 563/564 caliber. The 563 was the non-COSC version of the movement so it is in my opinion the 751 is based on the 564 as it was the COSC certified movement back then. In today's market these 751 base Constellations are way under valued given their significance of the line with being the first in the Constellation line with integrated bracelets. With the cushion case made from a solid block of steel, or gold, they have just enough funky 70's vibe that works with today's fashion without being too large and funky that cause it to not slip under the cuff of a dress shirt. 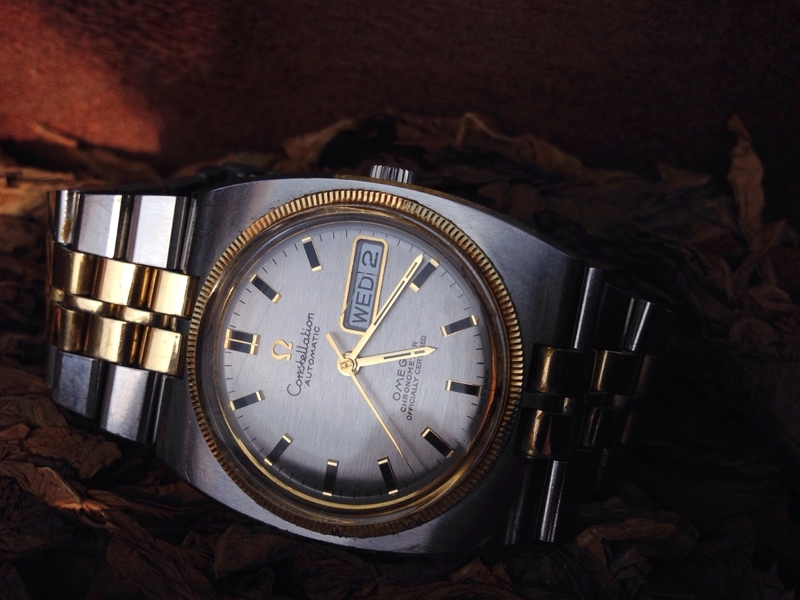 With the recent bastardized release of Constellation with the Pie Pan dial and fluted bezel I personally think these fairly easy to find 168.045/368.845 models should be respected more as they help launch the current Constellation line.